Surface is high performance, salon exclusive hair care that respects personal health and the earth. 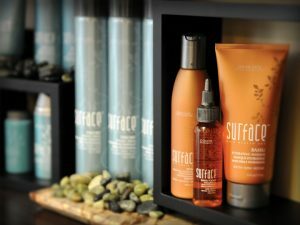 Inspired by salon owner and International Hair Stylist Wayne Grund along with the Surface Art Team comprised of stylists and salon owners throughout North America, Surface was founded on the promise of “Respecting Personal Health and the Earth”. Surface incorporates sustainably harvested ingredients and certified organic botanicals in all Surface products. The Surface culture is committed to growth, personal health, respect for earth and self and to giving back. From the Seattle-based SEVEN salon comes a line of products that produces touchable, luxurious, naturally three-dimensional hair. These are products that will make your hair look great and feel great, with high-performance formulations that work for stylists, but also make it easy to create healthy, elegant, lightweight looks at home. Whether creating ocean-kissed waves, chic chignons, or glossy curls – SEVEN give you everything you need to let your unique beauty shine through. The exclusive polysensoral textures made from Linseed Extract, Vitamin E, Omega – 3 and Omega – 6 assist to restore the hair cuticles, for fair with exceptional ultra-shine and softness. 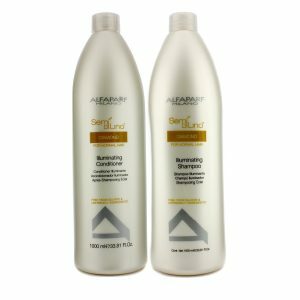 Alfaparf finishing and styling products contain avant-garde technology that easily shapes and holds hair with the outstanding shine in Linseed. The microcrystalline formulas in Alfaparf Milano Hair Care generate and defines nearly every type of style! 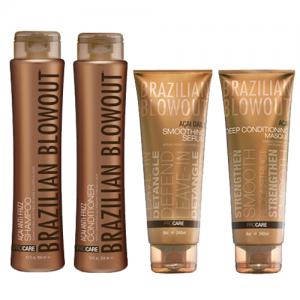 Brazilian Blowout is the only smoothing treatment that can be customized to keep curl and lose frizz, or to achieve a sleek and straight result. Known for significantly reducing drying and styling time for up to 12 weeks, a major benefit of this treatment is that it is finished at the salon with no “down” time. This means you can leave the salon and immediately wash your hair, exercise, put it in a stylish pony tail or clip without having to wait days to do so.